Grand Central Terminal beautifully meshes architectural splendor, commuter chaos, and historic, diverse restaurants -- perfect for catching up after you pick up a passenger, knocking a few back with colleagues, or impressing a date fresh in from Connecticut. The terminal and surrounding area is ready with Danish pastries for breakfast, spicy hand-pulled noodles for lunch, and that necessary happy hour cocktail after you clock out -- with some spots worth traveling for even if you don’t have a Metro-North train or subway to catch anytime soon. 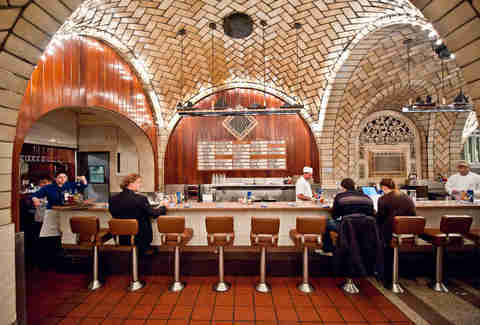 There are plenty of after-work happy hour spots around Grand Central, but not so many razzle-dazzle date destinations. Valerie has large-format romance in its expansive, amber-hued ground floor dining room, and a cozier bar for canoodling upstairs. You can sip beer, wine, and cocktails (including a robust gin and tonic selection), and nosh on kimchee Sriracha fondue, oysters, roast chicken, and short rib on whichever level of intimacy you’re looking for. Midtown can be a cold place any time of year. Defrost with a steamy bowl of broth and noodles at Bow Ramen. This teeny shop brings big flavors to its small, but efficiently designed space. 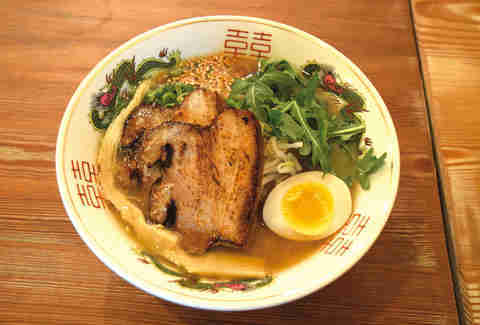 Slurp a pork belly shoyu, sliced chicken mo shio, beef-based miso bowl, or an order of vegetarian tan tan, rich with seaweed, bean sprouts, arugula, cherry tomatoes, and tofu. Yes, it’s another Irish Pub in a neighborhood rife with ‘em, but this one is new, unspoiled, and full of opportunity for you to become an early regular. Plus, they have a couple of television screens on either end of the bar, so you can likely catch a few minutes of the game without committing to a full-blown sports night. And you can still enjoy sports-night food, like chicken wings, guac, and burgers, alongside Irish staples like shepherd’s pie, and fish and chips. The hall -- curated by Nordic grub expert Claus Meyer -- is loaded with unique stands. Definitely carbo-load at Meyer’s northern European-style food cart, Meyers Bageri, just steps away from the ticket machine. Among the tempting stacks of Danish pastries, reach for the frøsnappers, which are glistening, twisted, and seed-packed. 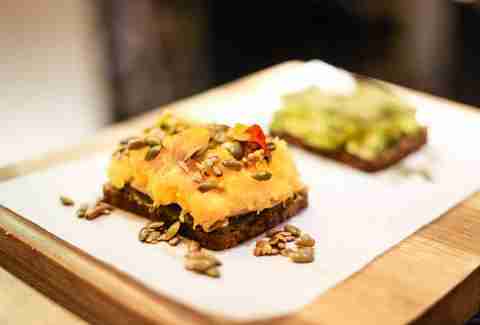 There’s also the Grain Bar scooping out quinoa bowls and Danish Dogs serving hot gourmet franks inspired by Copenhagen’s upscale street food -- picture toppings like Danish remoulade and crispy shallots. This legendary haunt has been serving its seafood raw bar and accompanying cocktails since 1913. The elegant, cavernous restaurant doesn’t have any windows, meaning any hour is happy hour if you’re ready to treat yourself after a long day (or morning). So here’s the pro tip: On Monday through Wednesday, from 4:30pm to 7pm, stop in for $1.35 raw oysters, $6.25 beers, and $9 martinis -- along with other hot seafood snacks, like chowder, for under $10. This food hall swarms with commuters in the morning and packs a steady crowd of finance-types during lunchtime. 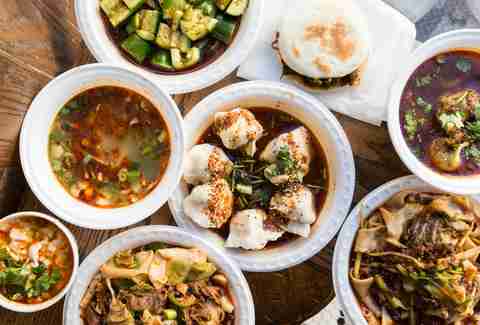 The lines move fast and the options are bountiful: There are sushi burritos from Hai Street Kitchen, Northern Chinese street crepes from Mr. Bing, and takeaway cups of ramen from Kuro-Obi by Ippudo. Make sure to check out the wood-fired pizzas at Roberta’s. This tiny outpost of the western Chinese hand-pulled noodle chain is close to Grand Central and is your best bet for quick, but still authentic, takeout. But be warned: Xi’an cautions patrons that the noodles grow “bloated, mushy, and oily” when they sit too long. So take advantage of the small seating area in the back of the narrow restaurant to slurp your liang pi cold skin noodles or spicy cumin lamb noodles in broth. If it’s just too crowded, hit Udon West at 150 East 46th Street. 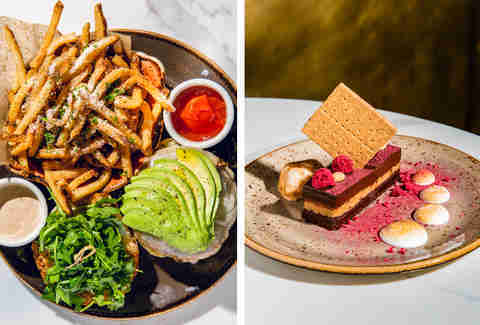 The sibling to upscale vegan restaurant Kajitsu, this meat-friendly neighbor is a nice respite from Grand Central’s mayhem. In addition to known entities like hot and cold soba noodles, carnivorous commuters can order comfort food staples such as miso soup and fried tofu. For more luxurious options, check out the tuna or wagyu beef donburi. 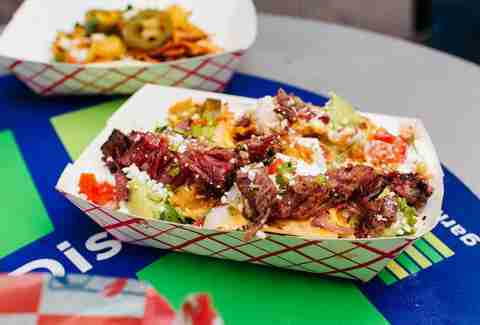 Once a tiny seafood shack in the East Village, Luke’s brings Downtown authenticity to homogenous Midtown. 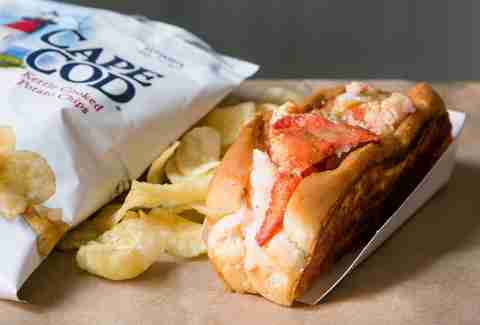 The location near Grand Central is appointed with an expansive outdoor dining area where you will enjoy the signature lobster, crab, and shrimp rolls as well as lobster-topped salads, seafood chowders, and wine and beer. The TKTS booth in Times Square. Looking for your ticket on the floor of Katz’s Deli. The line at the Shake Shack in the basement of Grand Central. They all scream avoid whenever possible. 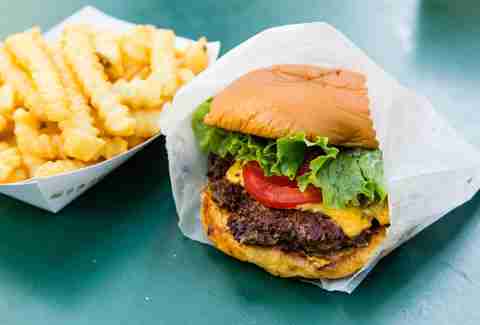 So when you have guests who just arrived in town, skip the line at the Grand Central Shake Shack and steal them away to the Third Avenue location, where you can get your SmokeShacks, Shack Stacks and crinkle-cut fries real fast -- and look like you got away with something. The fresh pasta at Davio’s is also available gluten-free -- so when your newly clean-eating friends pull in on the train from Beacon, New York, you’ll get points for attending to their dietary restrictions. The beige decor won’t be a staple of the night’s social media, but the red sauce offerings rival those found in Little Italy. 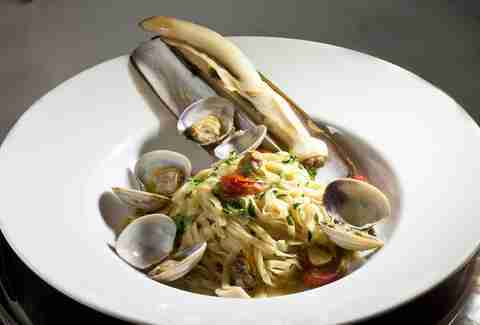 The pasta is served in fresh tomato sauce, tangled with clams in a generous portion of butter sauce, or shaped into agnolotti stuffed with braised veal. 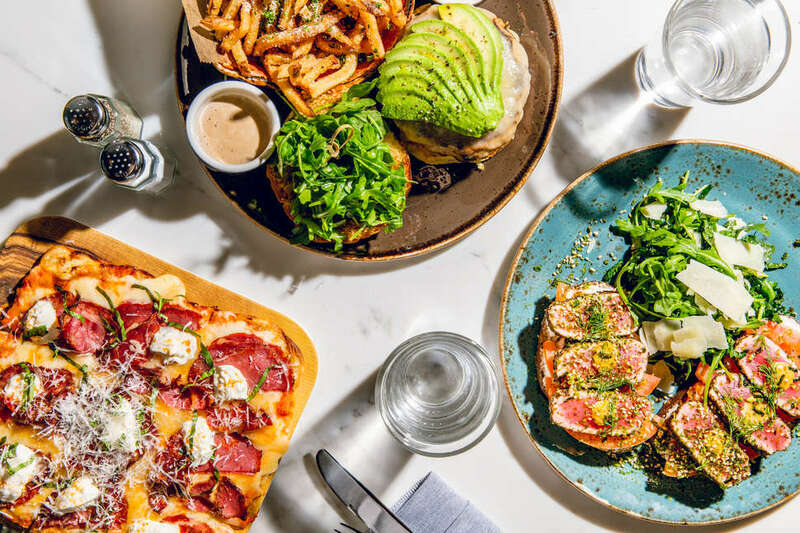 A three-minute walk from the depths of Grand Central awaits grilled, roasted, and pulled chicken served in bowls or salads with your choice of toppings like guac, bacon, and shredded cheese. 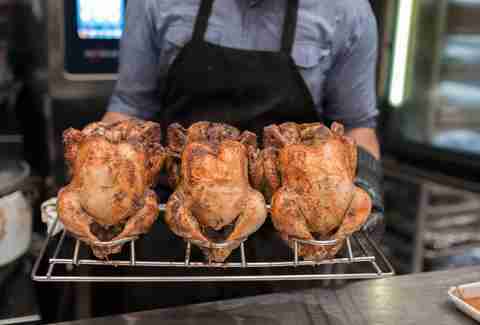 Juicy roast chicken is also available by the piece, served with a range of sauces and healthy-ish sides like herbed quinoa and Mexican-style corn. 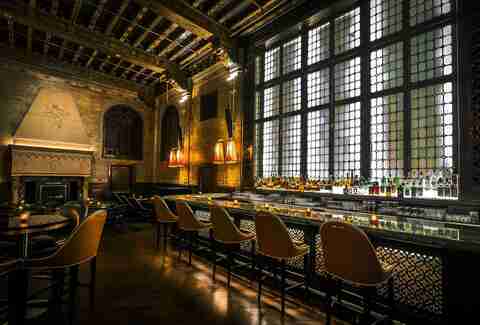 This Jazz Age throwback recently changed hands and underwent renovations, but its ambiance emerged unscathed and more inclusive than ever. Hospitality behemoth Gerber Group dropped the dress code and even installed signage at the formerly semi-secret hideaway. Prohibition cosplayers can still play speakeasy over classic cocktails like the $25 John Campbell’s Martini, named for the railroad tycoon whose ornate office set a dizzyingly high bar for Grand Central destinations. Melissa Kravitz is a regular Thrillist contributor.